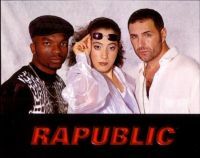 Members: Rap/Vocals : Chejah, Luana aka Stefania Cea, Tony Idowu (Rap), Mimmo Castelli vocals, and producers Norbert Reichart & Robert Hirschmann. Stefania Cea was born in Italy and established in Basel, Switzerland wher she was hip hop pioneer. After his father, its origins are from Jordan. Chéjah means "There is God." She colaborated with hip-hop legends like Afrika Bambaataa, Run-DMC, Grandmaster Flash and Cora E, Azania Steady, Mad Professor. Her debut album SerioSistaS (Fun Key, 1996) as Luana.